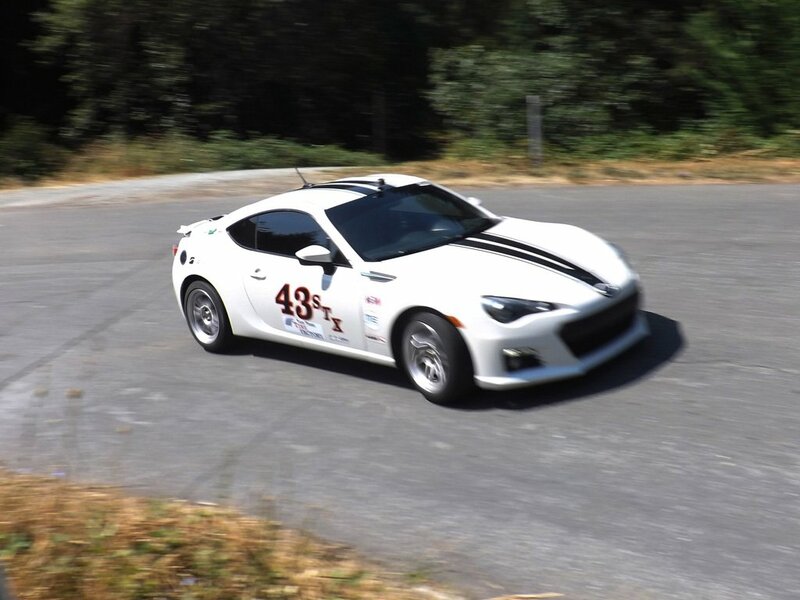 Most hillclimbs run about $125 per event. Yes, it is a little more expensive than your average $35 autocross, however you get what you pay for. And what you pay for is the opportunity to run your car like a madman up a closed public road. Johnny Law can’t write you a ticket for going 100 miles per hour in a 25 MPH zone during an event. When you think about how much that ticket would actually cost you, then a $125 hillclimb entry fee is a damn bargain. Using a cost comparison to autocross is appropriate because the required safety equipment and vehicle preparation is autocross dependent. SCCA solo classing is used to define vehicle classes (STX, AS, etc.) and the only thing you need to run an event is a car, a helmet, and the bravery we mentioned earlier. The only real difference between hillclimb and autocross preparation is you have to wear a long sleeved shirt and your car needs to have a fire extinguisher. 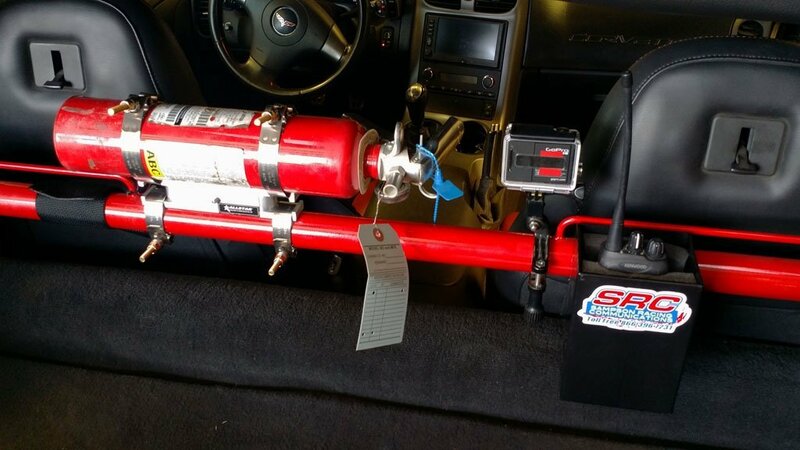 We used a simple mount purchased from I/O Port Racing Supplies to attach an extinguisher to our harness bar. Other than that modification any vehicle can run (your daily driver or your trailered racecar). 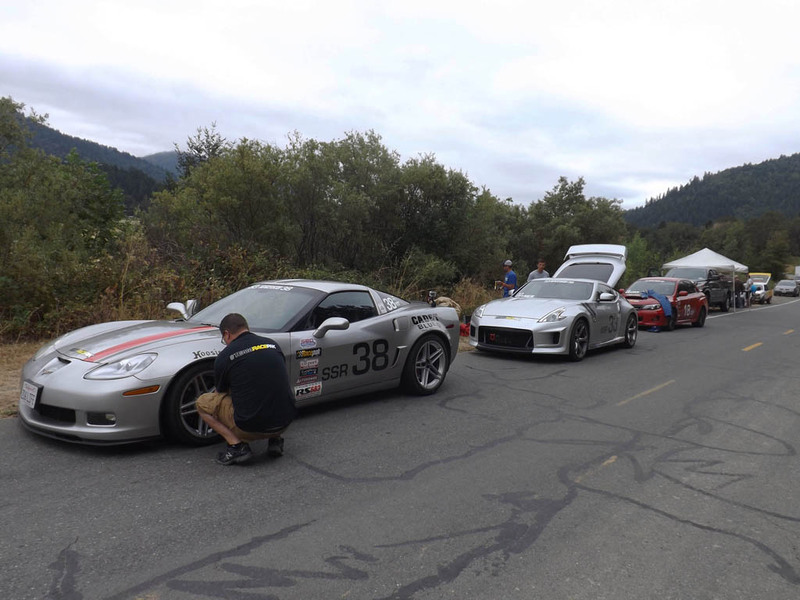 The Northwest Hillclimb Association (NHA) runs hillclimbs in Oregon, Washington, Nevada, Idaho, and California. 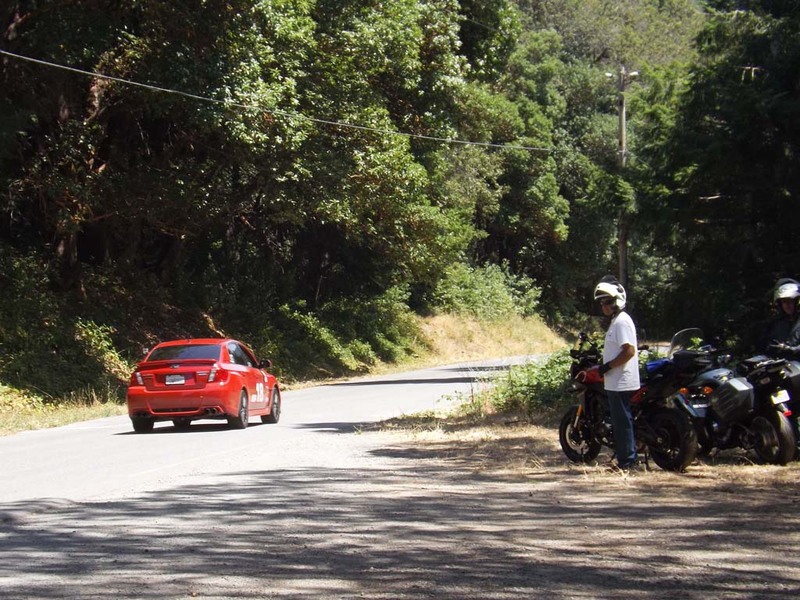 For the Hoopa Hillclimb, held on the Hoopa Indian Reservation in Northern California, the Redwood Sports Car Club keeps track of the records for the Hoopa hill. The biggest event for hillclimb racing in America is Pike’s Peak which requires a lot more vehicle prep (roll cage, etc.) and entry fee cost than those run by Northwest Hillclimb Association (NHA). 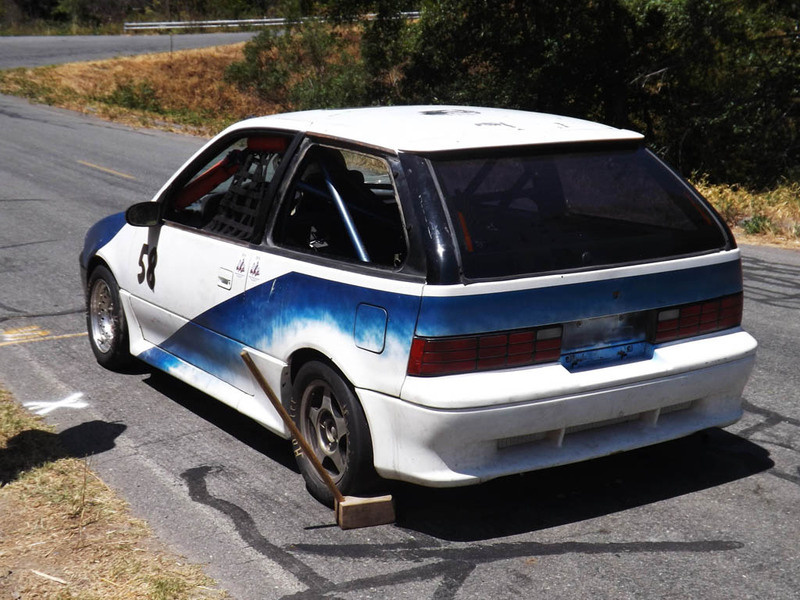 The big difference between hillclimbs and any other forms of motorsport is in the photo above: a wheel chock. This handy little wooden device is placed behind your rear tire at the start so you can take your foot of the brake without worry of rolling backwards. This way you can concentrate on the clutch and the gas for a good start. The device is ingenious and is used by European hillclimb associations as well. If adrenaline is what you seek, then seek no further. Running a car at the limit while screaming up a narrow mountain road is the ultimate. But just as Patrick Swayze’s character, Bodhi, from Point Break said, “If you want the ultimate, then you have to be willing to pay the ultimate price.” As much as we compared the costs, the classing, and the car preparation to autocrossing, let me be clear: this ain’t no autocross. Little orange cones aren’t all that you will collide with if you lose it here. You will hit a rock, or you will hit a tree, or you will miss the rocks and the trees and then you will roll down the mountainside until you stop… by hitting other rocks and trees. But once you get past the fact that your car’s health is on the line, the racing is very intense. You get a serious sense of speed as you apex telephone poles and you see the trees whizzing past your peripheral vision. Hillclimbs today are what road racing was like during the 1950s and 60s: the track is narrow and any runoff area is nonexistent. 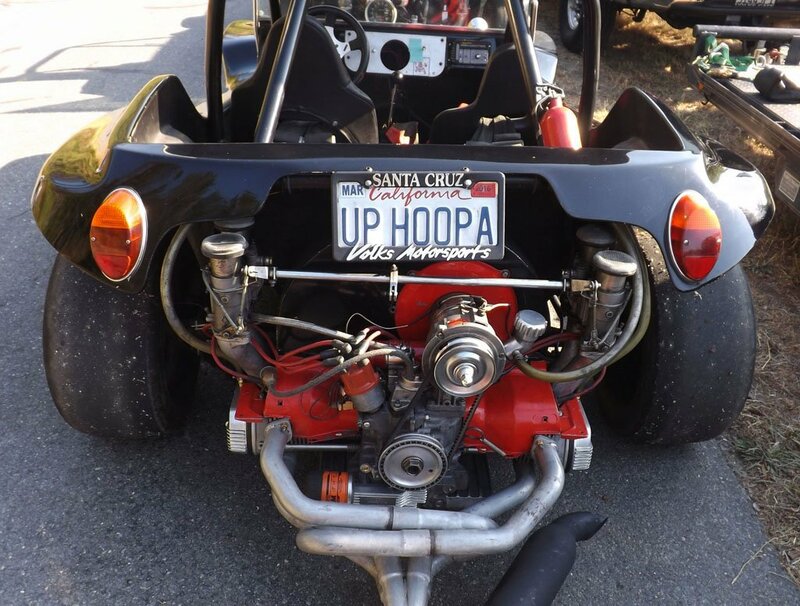 The Hoopa Hillclimb event is 2.2 miles in length, climbs 1,160 feet in elevation, and has 12 turns. The entire run was over in around two and half minutes. During a weekend event each car completed 4 runs total. This all means that as long as you don’t lose it (and make love to the hillside), you really won’t put that much wear and tear on your car. You will use a little clutch on the hard starts, you will use some brake pads slowing for each of the insanely tight 12 turns, and you will put some hard miles on the outside edge of tires. But overall I don’t see the wear and tear on the car as being that much more than an autocross. Of course, there is the risk that you might have an “off” which means almost certain damage. 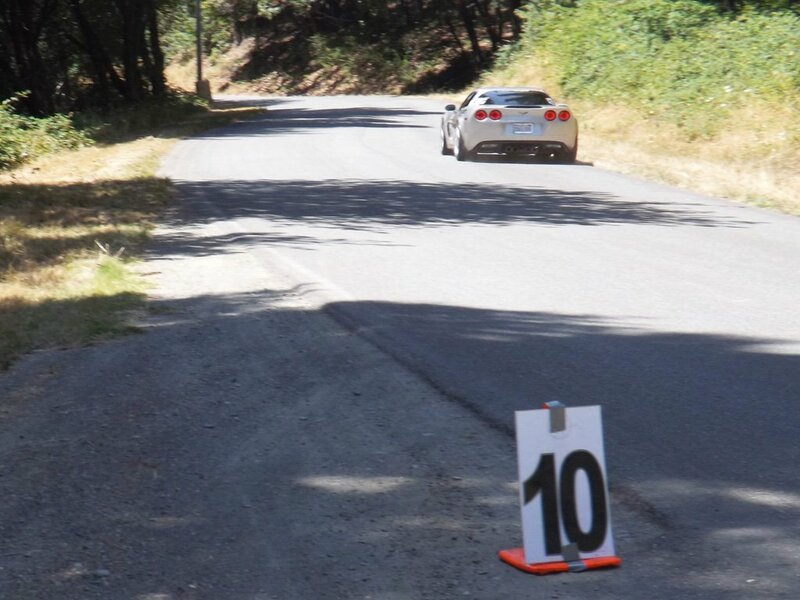 We saw one car totaled, and two cars with serious body or suspension damage at the Hoopa Hillclimb. If you don’t hit anything, it’s all good, if you do hit something, it’s all no good and you are explaining to your wife why you still owe the bank money on a car loan for a car you totaled up on the hill. I hope you like sleeping on the couch. Similar to autocross they will divide the cars up into two run groups as this is a driver/worker swap type of event. You will sit on a corner with a fire extinguisher in your hand and watch cars go up the hill, and then later in the day you will get your chance to be the one driving like a madman. Part of your day will involve some waiting as the road opens for a few minutes so logging trucks can get by. The trucks are kind enough to drop water that they use to cool their brakes on the racing surface and occasionally large chunks of lumber. 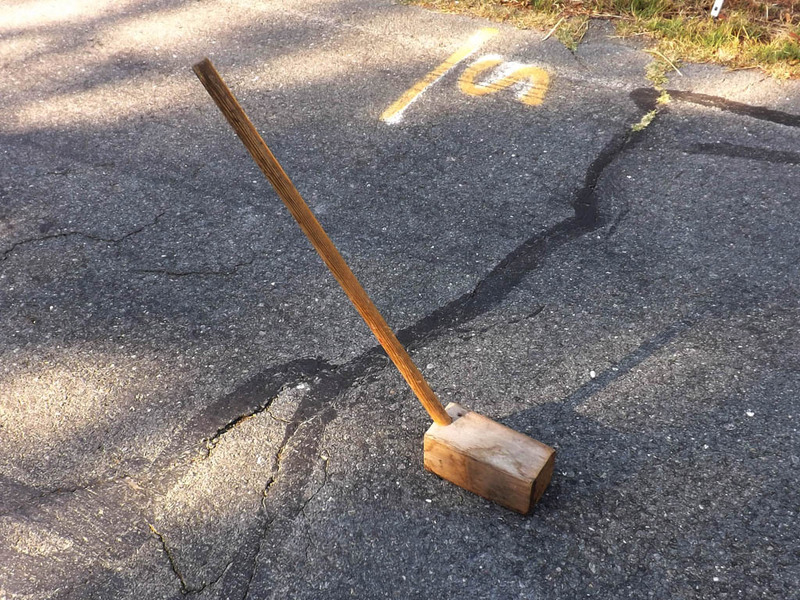 Another job of a corner worker is to use brooms to sweep the roadway before the next racer comes along. Finally it will be your turn to head up the hill. If you are a rookie you will feel completely lost. No matter how many YouTube videos you watch of other people running the hill or how many times you drive up the hill early in the morning at public road speeds before they close the course for the race, you will still feel uneasy about the course. There are portions where the track is blind so you may not feel comfortable keeping your right foot planted on the “go pedal” when it absolutely should be. The run up the hill is an absolute rush. You will scare yourself when you go a bit too hard, and you will frustrate yourself when you go too easy. Because you are always going uphill any mistake you make will be felt exponentially. You will lose momentum and extend your time. The key (like in any racing) is to be smooth and fast. Any tire spin will hurt your time, any sliding will hurt your time, and any wussing out for the fast sections will hurt your time. To go fast you need some bravery. After your run you will park at the top of the hill with other competitors and wait for the racing to cease so the road can be open to regular traffic for a few minutes. Then you and your group will parade down the hill and wave at the spectators as you head down to prepare for your second run. The second run is just like the first (only hopefully faster). The first day ends with the racers getting together for some cold beverages and some bench racing. The second day is a repeat of the first, with two more runs each and you will again be required to work the course. The second day is an interesting one because you will have spent the entire night before pouring over your GoPro footage trying to find ways to improve your time. The good news is the corners are numbered so you can mentally keep track of where you are on course (since most of the corners look identical). 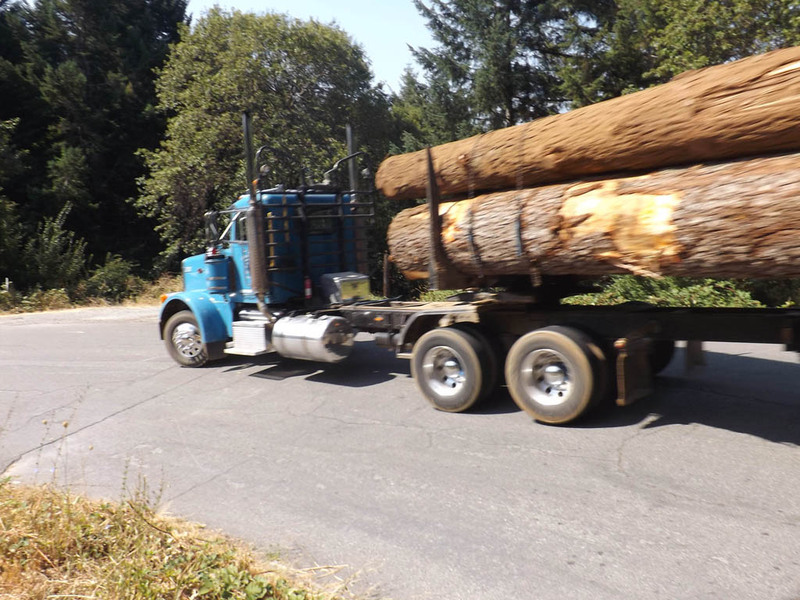 There may be some delays during the day, not from more logging trucks, but from your competitors smashing into trees. The hillclimb operates with a tow truck at the bottom of the mountain for good reason, as things get bent. Some recoveries take longer than others and you may find yourself sitting in grid with your helmet on for a long time as you wait to see the unsightly view of a totaled racecar (which in most cases is a street car) being drug off the course. Hillclimbers are a unique dedicated group of motorsport junkies. They are like most car folks but they have a little more grit to them. 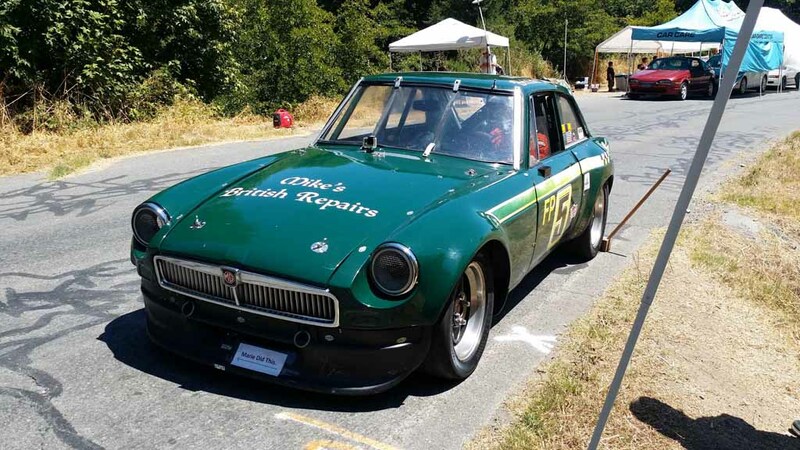 They will total a car on the hill one year, find a new unibody, completely rebuild the car, and then be back to the hill to do it all over again (risking the rebuilt car in the process). Hillclimbers are always thinking about the record and what they can do to beat that record. Sometimes that might be their own personal record, while other times it might be a class record or the overall hill record. They study the hill like it is the eighth wonder of the world and they continue to search for their next tenth of a second. There is some glory to be found at the hillclimb if you win. Events have trophies for first place finishers and they have a season long point system for a championship. 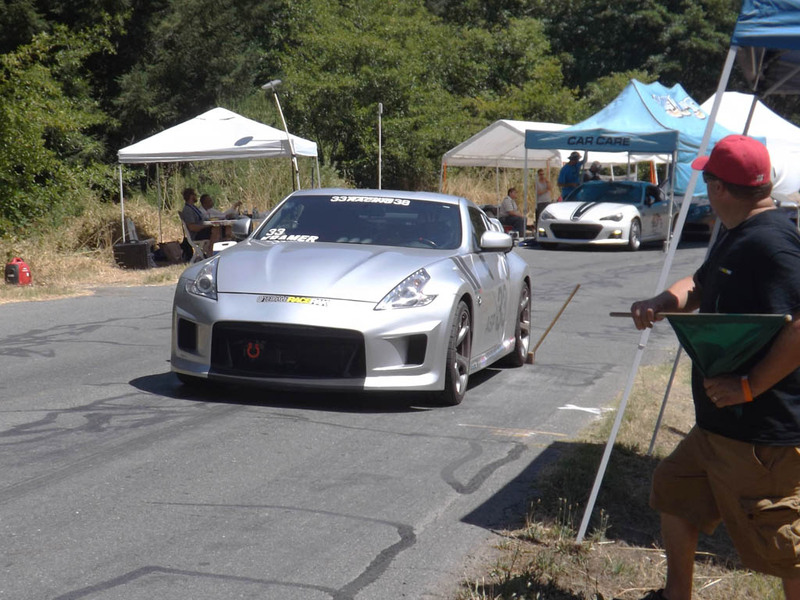 At the Hoopa Hillclimb if you break a hill record for your class, the next year’s event t-shirt will have your name on the back with your time listed. Additionally, they have a website listing all of the records next to the record holder’s name. The other glory comes from the fact that there are spectators along the course rooting for you to hang the tail out in every corner. You can’t always see them as you go up the hill (you should be looking for the apex) but you can hear their clapping and hooting and hollering as you drive back down the hill after making your run. You won’t find that at an autocross. To win this event you need to know the hill like the back of your hand. They say it takes about five years to really learn a hill. You have to possess confidence to be able to know where you can go really hard (most straights) and where you need to give it up (most turns). But the real art is knowing which turns you can take faster than others to be just a little faster than the next guy up the hill. Watching YouTube videos of people racing up the hill can help you learn the course. However, you need to see the hill with your own eyes, and at speed, to really know it. 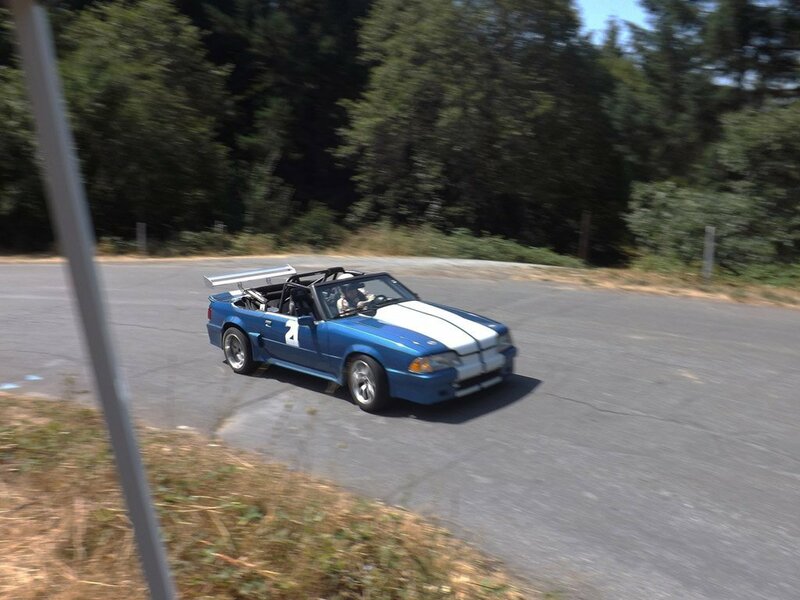 Having a car that is competitive in its respective SCCA solo class is helpful in earning a class win, and horsepower does matter when it comes to powering up the hill. But to become “King of the Hill” (the overall winner) you need to show up with something LS powered, lightweight, with a big wing, and a have the gonads to drive it like you stole it. At the hillclimb there is no replacement for displacement (or huge balls). Oh, you want to know what the Racer Boy’s record was? As a rookie it was a 2:19:04 in a 2006 Corvette Z06 with a radar trap speed of 100 MPH. Scared the living crap out of me while doing it. I invite any other automotive journalist to try and break it. Right now Speed:Sport:Life owns the Auto Journo record. FUEL (Cost): The fuel gauge is three quarters full because this event isn’t as cheap as autocrossing but it is certainly much cheaper than wheel to wheel road racing. Due to the remote locations where hillclimbs are held, generally there is some travel involved which incurs fuel and hotel costs. Unless you are a blood member of the Hoopa Indian Tribe, which chances are you aren’t, then you will be doing some travelling. RPMs (Adrenaline): The tachometer is at 6,800 RPMs because this kind of racing is scary. Apexing trees, trying to avoid crashing into a spectator’s park car along the course, and dodging animals that cross the track while you are threshold braking into the corners, this will get your blood pumping. NOTE: Bring a clean pair of underwear, just in case. MPH (Danger): The speedometer is at 100 miles per hour because that is the speed we hit on the main straight (which actually has curves) in a Corvette Z06. The danger factor could be considered 161 miles per hour (since danger lurks around every curve like an 80s horror movie), but our gauge doesn’t go that high. VOLTS (Time): The volts gauge is over three quarters full because this event isn’t too time consuming. Car prep is similar to autocross so not much time spent there. You will need an entire weekend to attend an event. If you stack a car up, then, of course, you will needs lots more time to put your car back together. MILEAGE (Car Wear): The mileage is at 3,000 miles because even though with only four runs at 2.2 miles each, equaling 8.8 total miles of actual driving, this is hard driving. Your brakes, engine, clutch, and tires will all feel the anger of your right foot as you push yourself to get up the mountain quickly. And if you push too hard, go ahead and consider the mileage to be 999,999 and game over. 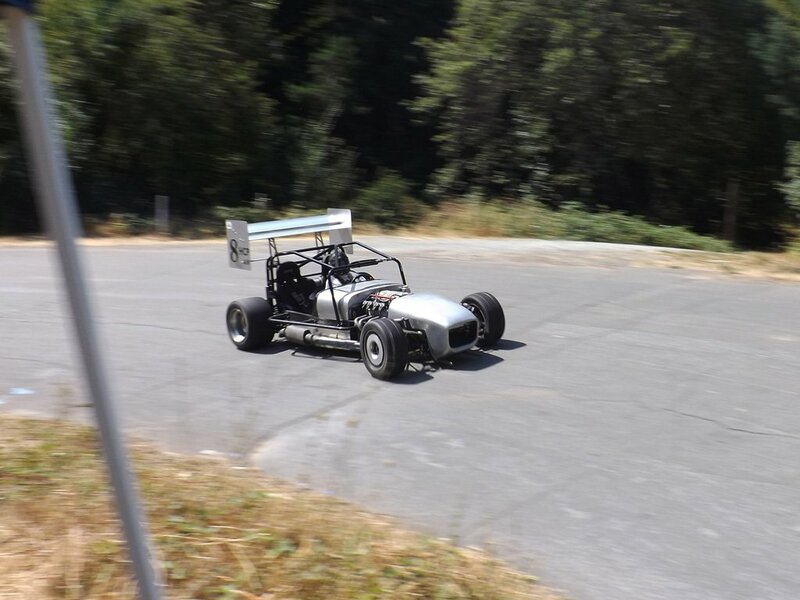 Hillclimbs are truly the ultimate rush for a motorsports junkie and they can be entered by anyone with nothing more than a car and a helmet. No racing license or intricate roll cage is required, which is a bit ironic because I never felt as if I ever needed a roll cage more than when I was driving up the hill at ludicrous speeds. Entering one of these events is a personal choice. If you want to do it, all you need are the guts to lay it all out on the line, and the willingness to be faster than anyone else. See you on the hill! If you enjoy Rob Krider’s Racer Boy column then check out his novel Cadet Blues available in print or e-book at Amazon. Photos for article by Austin Fowler.